Now Available – the Texas College Guide: The University of Texas at Austin. 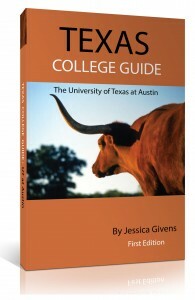 We are excited to announce that Jessica Givens’ new book, Texas College Guide: The University of Texas at Austin, is now available for purchase in hard copy or as an e-book from Amazon! Click here to order. This new guide walks its reader through every aspect of applying to UT, from a review of the school’s admissions practices to a major-by-major breakdown of each school. Whether you’ll be applying to school this fall, next year, or even if you’re still several years out – this book will guide you through the process and give you a solid foundation for an admission strategy that makes sense. This is an abridged version of the Table of Contents – there is A LOT covered – but it will give you an idea of the flow of the book. – To AP or Not to AP? Here is an excerpt from the overview of the Cockrell School of Engineering. I want the book! How do I get it? The book is now available on Amazon as a paperback or for Kindle.